Heritage Cove, Fort Myers, Florida 33919 is a fifty five plus gated community located just off McGregor Boulevard in tropical South Fort Myers. Heritage Cove is a private, gated community perfect for active seniors 55 years of age and older If you need more information about Heritage Cove or other Fort Myers Real Estate, feel free to Contact Shellstar Realty. Our Realtors Have many years experience and can help you obtain the best price on your real estate purchase! Heritage Cove 55 Plus Homes – Fort Myers Real Estate – Updated Heritage Cove MLS search! 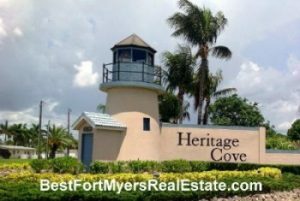 Heritage Cove community is a 55 and over HOA gated community located in south Ft. Myers. This community offers activities for all interests. Heritage Cove has a clubhouse for meetings or just playing cards with friends. Outside, enjoy the beautiful resort style pool and warm jacuzzi. Take a few steps to the pier jutting into the large lake. Fish huge bass from the pier, or enjoy the private sandy beach. Heritage Cove offers Bocce ball, shuffleboard and horseshoes. Tennis enthusiasts will love the clay courts, with spectator bleachers under shade from the sun. There are also lights for evening play. Heritage Cove community consists of 529 homes, comprised of condominiums, villas and single family homes. The area is beautifully landscaped, a gated community located close to all the amenities of Ft. Myers. This community is close to shopping, dining and restaurants- it is also convenient to the beaches of Ft. Myers Beach and Sanibel. Search other Fort Myers 55 Plus communities.